A list of events you should know about in 2017. January 3 – US House Republicans backs down on plans to gut the independent Office of Congressional Ethics after a public uproar. January 12 – President Barack Obama awards Vice President Joe Biden the Presidential Medal of Freedom. January 18 – NASA and NOAA announce that 2016 was the hottest year on record. 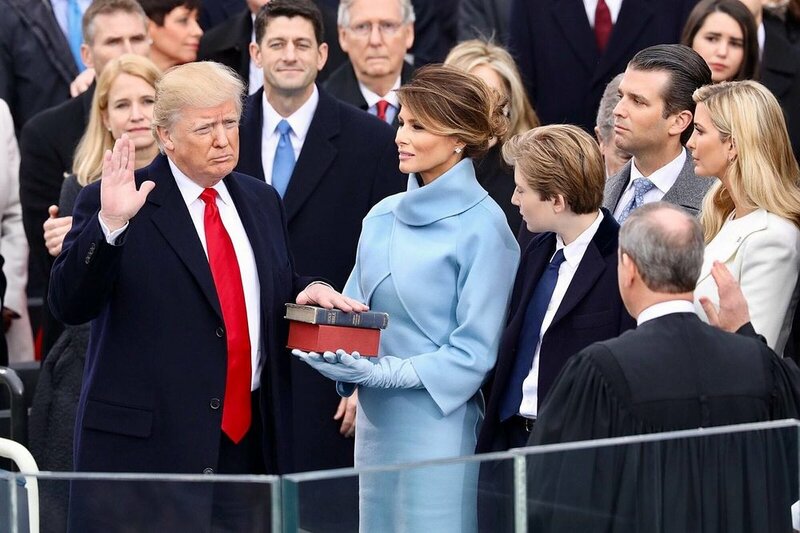 January 20 – Donald Trump is sworn in as the 45th President of the United States, becoming the first non-political office holder to assume the title. January 21 – Millions join the Women’s March in response to President Trump’s inauguration. Over 420 marches are reported in the United States, making it the largest single-day protest in American history. January 27 – President Trump issues an executive order to ban travel to the US from 7 Muslim countries and suspends admission to refugees. January 31 – President Trump fires Attorney General Sally Yates for instructing Justice Department officials to defend his travel bans. February 8 – Jeff Sessions becomes the US Attorney General after a series of controversies and protests. February 11 – North Korea fires a ballistic missile across the Sea of Japan. February 13 – Michael Flynn resigns as the National Security Advisor over his dealings with Russia. March 2 – Jeff Sessions recuses himself from the investigation into Trump campaign contacts with Russia after news breaks about his meetings with Russian officials. March 6 – President Trump signs a second executive order to ban travelers from another 6 Muslim countries for 90 days. Iraq is excluded. March 10 – The United Nations warns the world about the looming humanitarian crisis; Up to 20 million people are at risk of starvation and famine in Yemen, Nigeria, Somalia, and South Sudan. March 16 – President Trump’s second travel ban is blocked by two federal courts. April 6 – The United States military launches 59 Tomahawk cruise missiles at Syria in response to a suspected chemical weapons attack on a rebel-held town. April 13 – The United States drops the world’s largest non-nuclear weapon, the GBU-43/B MOAB (Massive Ordnance Air Blast Bomb), at an ISIL base in Afghanistan. May 9 – FBI Director James Comey is dismissed by President Trump. May 10 – President Trump shares classified information about ISIS with Russian Foreign Ministers. May 22 – A terrorist kills more than 22 people and injures another 500 during a bombing attack at an Ariana Grande concert in Manchester, England. May 24 – Internal opposition forces the GOP to pull their attempt to repeal Obamacare. May 28 – President Trump signs Energy Independence order, undoing President Obama’s climate control initiatives. June 1 – The United States announces its withdrawal from the Paris Climate Agreement. June 12 – Jeff Sessions testifies and denies meeting with Russians. June 14 – US Senate approves sanctions against Russia for interfering with the 2016 elections. June 16 – President Trump reinstates Cuban travel and business restrictions. July 4 – Russia and China urge North Korea to terminate its nuclear programs after North Korea tests its first intercontinental ballistic missile. July 7 – 122 of 193 UN member states vote on the Treaty of the Prohibition of Nuclear Weapons. July 21 – White House Press Secretary Sean Spicer resigns. July 26 – President Trump bans transgender people from the military. July 28 – John McCain casts vote against the GOP repeal of Obamacare. It fails 51-49. July 31 – After less than two weeks in his position, Anthony Scaramucci is removed as the White House Communications Director. August 5 – A unanimous vote from the UN approves new sanctions on North Korean trade and investment. August 12– 19 are injured and one is killed as the “Unite the Right” rally turns violent in Virginia. August 14 – President Trump condemns racist violence at the White House. August 18 – Steve Bannon is fired as White House Chief Strategist by President Trump. August 25 – A Category 4 hurricane devastates the United States. Hurricane Harvey causes the death of more than 90 people and $198.6 billion worth of damage, becoming the costliest natural disaster in the United States history. September 3 – North Korea conducts its sixth most powerful nuclear test. September 6 – Hurricane Irma strikes the United States and the Caribbean. The Category 5 Hurricane causes 134 deaths and $63 billion worth of damage. September 19 – A 7.1 Mw earthquake kills more than 350 people, injures 6,000, and leaves thousands homeless. September 12 – Hurricane Maria follows a similar path to Hurricane Irma, causing an additional 94 deaths and $103 billion worth of damage. September 19 – President Trump vows to “totally destroy North Korea” if they threaten the United States. October 1 – Stephen Paddock opens fire into a concert in Las Vegas from his hotel room. 58 people are killed and 546 people are injured. This surpasses the 2016 Orlando shooting as the deadliest mass shooting by a lone gunman in US history. October 8 – Wildfires devastate Northern California, killing 41 and displacing 20,000. October 12 – The US and Israel withdraw from the United Nations Educational, Scientific and Cultural Organization (UNESCO). October 14 – A truck bomb in Somalia kills 512 and injures another 316. November 12 – A 7.3 magnitude earthquake strikes the Iraqi-Iranian border, killing 530 and displacing 70,000. October 30 – President Trump’s campaign managers, Paul Manafort and Rick Gates, are indicted on fraud charges. Advisor George Papadopoulos is found guilty for lying to the FBI. October 30 – President Trump’s ban on transgender people in the military is blocked by US federal judge. November 5 – Devin Patrick Kelley opens fire at a church in Sunderland Springs, Texas, leaving 26 dead and 20 injured. November 14 – Australia votes to legalize gay marriage. November 24 – 305 worshippers are killed during a mosque attack in Egypt. December 1 – Michael Flynn pleads guilty of to lying to the FBI. December 4 – President Trump scales back two national parks by 50-85%. December 5 – Russia is banned from the 2018 Winter Olympics after an investigation about using banned athletic performance-enhancing drugs. December – Australia votes to legalize gay marriage. December 9 – The Iraqi Military announces that it has liberated Iraqi territory from ISIS and has regained full control of the Iraqi-Syrian border. December 20 – US House and Senate pass the biggest tax bill in recent decades, around $1.5 trillion. December 22 – The UN Security Council votes in favor of additional sanctions on North Korea. Petroleum imports will be slashed up to 90%.